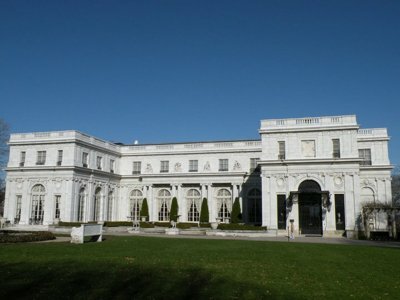 Rosecliff Mansion - The place to party...from the Gilded Age up until today! The place to party...Gilded Age up until today! You may also recognize this house from some movies that have filmed scenes here, most notably: The Great Gatsby and True Lies. Actually, it continues to be a great location to throw a party, hold your wedding or host a corporate event. 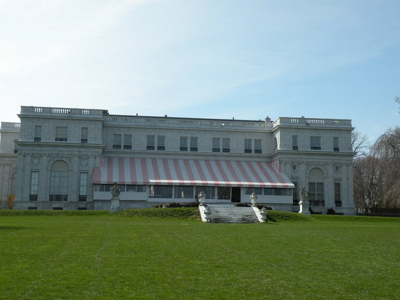 This Newport mansion can be rented for any special event you have coming up. This 21 acre "summer cottage" was originally the home of Nevada silver heiress Theresa Fair Oelrichs. 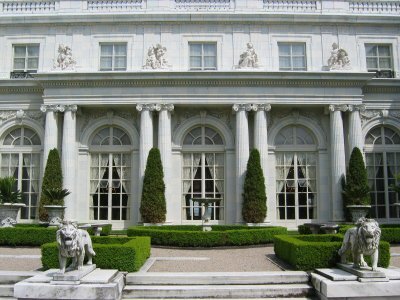 It's design by architect Stanford White was based on the French Grand Trianon at Versailles. The work was completed in 1902, at a cost of $2.5 million. Some of the notable features of this property are the limestone "sweetheart's staircase" and 40x80 foot ballroom, where Arnold Schwarzenegger tangoed with Tia Carrere in True Lies. 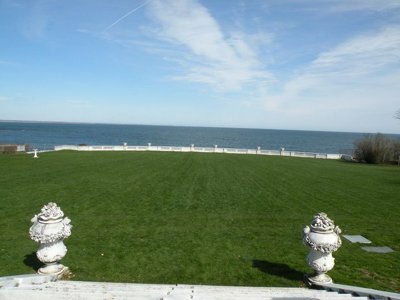 Although the house itself is amazing, my favorite part of the property is the lawn in the back that overlooks the Newport Cliff Walk and the Atlantic Ocean. I like to imagine myself waking up, strolling down the lawn with a cup of coffee, and sitting on the railing enjoying the ocean breeze and the passing sailboats. Not a bad way to start the day! Click on the panoramic image below to view a larger image of the amazing view of the Cliff Walk and Atlantic Ocean from Rosecliff's back lawn. Actually, I have spent quite a bit of time here. I used to work many of the events that were held here during the summers. I've been fortunate enough to see the mansion and the grounds many times. Now that I think of it, I might have spent even more time here than some of the previous owners, who only summered here for a few weeks per year! If you happen to be planning a wedding or corporate event, I highly recommend this location for it. There is plenty of room inside, and if necessary, you can use the patio and even the lawn if you have more than a few hundred guests. 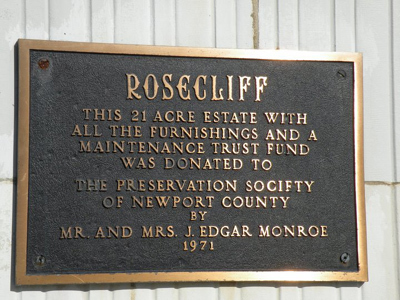 Rosecliff, along with many of the other Newport RI mansions, is now run by the Preservation Society of Newport County. The last owners, Mr. and Mrs. J. Edgar Monroe, of New Orleans, gave the house and a generous endowment in 1971. The mansion is open for tours from May-October, and hosts many interesting events during the summer season. One of the most popular is the Newport Flower Show, which is held over the weekend of June 26, 27, and 28 2009.